It’s understandably equipped to be a compact traffic car, meeting the current standards of the National Policing Improvement Agency (NPIA) for a fast-response vehicle both inside and out. The roof-mounted emergency lighting is all-LED, while the dashboard sports a mobile data terminal and screen to illustrate the Focus ST’s versatility as a police vehicle. The car was displayed at the National Association of Police Fleet Managers’ Conference and Blue Light Fleet Exhibition (NAPFM) in Peterborough. The model shown is a 2013 Ford Focus, 2.0-liter EcoBoost, intended to show what the SVP modifiers started with in the patrol car adaptation. After all, to work with England’s unarmed Bobbies, it not as though it has to outrun an Aston Martin – the police radio takes care of those concerns. Though the public can’t get a Ford Focus prepped for British Police Patrol, it is available to them as the all-new Ford Focus ST in five vivid colors including Tangerine Scream and Spirit Blue. The 2.0-liter 250PS EcoBoost engine can accelerate from 0-62 mph in just 6.5 seconds and has a top speed of 154 mph. That might not work for the wide-open spaces of the American West, but it could easily fulfill a role in the British Isles. Then again, you still can’t outrun modern communications wherever you may go. 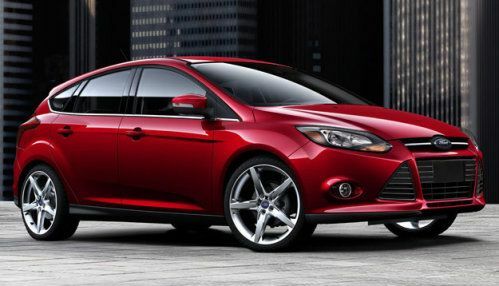 Does the Ford Focus ST really have a role to play as a police cruiser? We have our doubts, but stranger things have happened.